Shane Shirley : What Is The Future of Green Cars? What Is The Future of Green Cars? Consumers Embrace Electric Vehicles But What’s Next? It seems that electric vehicles (EV’s) are finally mainstream and consumers worldwide are purchasing them in record numbers. Nissan was so excited over their February EV sales numbers that they released them early with their sales showing 12 straight months of year-over-year sales increases for the world's most popular battery-electric vehicle, the Nissan Leaf. "Longer term, we believe that electrification will continue to grow as more customers recognize the inherent benefits of driving on electricity." said Mike Tinskey, Ford Motor Company's Global Director of Vehicle Electrification and Infrastructure. "To date, industry sales are modest - 4% of all new sales are electrified products (PHEV, HEV, BEV) – but it is growing as this number was only 2% in early 2012." "Bottom line, people are either getting bored of hybrid cars, their gas cars or truck and speaking with their wallets for some increased form of electric transport. " says Seth Leitman, Green Living Guy. Today the choices in design offer something for everyone and range anxiety is becoming a thing of the past with charging stations popping up worldwide to reduce range anxiety. "The US and Europe are in a close race based on charging station numbers. We are seeing about 23,000 stations in the US, and roughly 20,000 in Europe. This is data from January 2014, and with Europe on a fast installation pace, our estimate is that the two regions are a close tie." said Tinskey. But now many are wondering what is next for the future of green cars? This past January when I was in Detroit for the North American International Auto Show (NAIAS), there was a lot of buzz about Ford's C-Max Solar Energi Concept Car, a collaboration between Ford, Georgia Institute of Technology, and SunPower Corporation. "Ford, SunPower and Georgia Tech have been partners for several years – working on a several of sustainability-focused projects such as the Drive Green for Life program. In early 2013, with SunPower’s announcement of a 21% efficient module, we determined the time was right to start looking at recharging our plug-in vehicles using solar energy directly. We discovered a way to use a solar concentrator in an innovative way to provide 21 miles of all-solar driving per day." explained Tinskey. 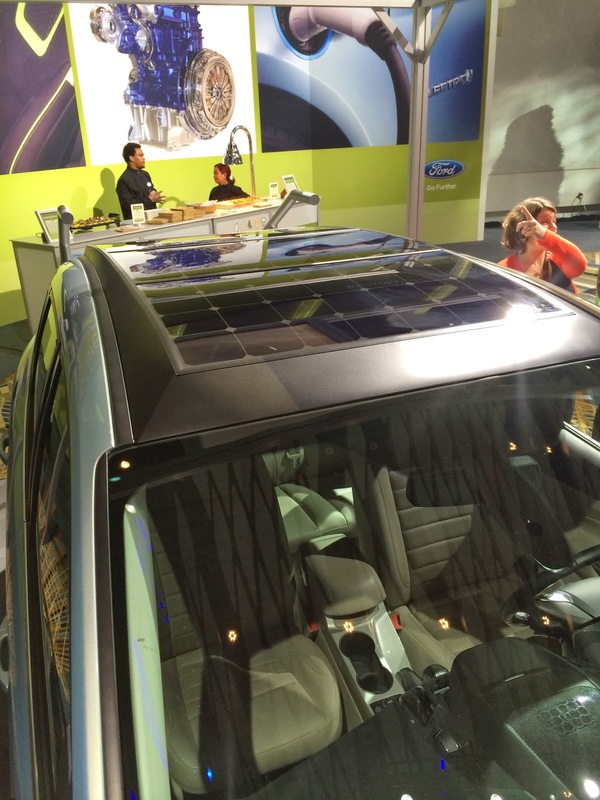 The C-Max Solar Energi has a small, solar array on its roof that can charge the green car in a day. Of course this only works if it is a clear day without a cloud in the sky and if the sun stays centered directly over the car. Stated charge time is with no clouds in the sky and if the sun stayed perfectly centered over the car. Any change in that weather pattern would create a much longer charging time. Still, Ford has a patent-pending system that will deal with that problem. Tinskey added, "The C-MAX Solar Energi is a concept vehicle intended to start the conversation of what is possible when EV is combined with PV (photovoltaic). We’ll continue to develop the concept, but haven’t talked about any production intent." Will Hydrogen Really Go Mainstream? Each time the subject of green cars comes up, the subject of hydrogen powered cars also comes up in the conversation. Hydrogen is the most bountiful element in the universe so it is not a big surprise that it has such a green side. Still, it has to be split from other molecules, here on Earth, which is not easy and with the current trend toward EV's and Hybrids, hydrogen seems to be losing steam. Hydrogen-powered cars are much like EV's but instead of batteries, the electric motor is actually powered by a hydrogen fuel cell. Cars running on hydrogen have all the advantages of an electric motor and they also emit no carbon dioxide or nitrogen oxides. The only thing that does come out of the exhaust pipe is water. Filling up a car with hydrogen is pretty much like filling up at the gas pump and unlike charging an EV, it takes about the same amount of time at the pump as filling your gas guzzler. Still, once again, there are drawbacks to this green ride. Although hydrogen makes up 77% of matter in the universe, here on Earth it is rarely found on its own and is usually found in a molecule with other elements like water (H2O). Unfortunately, splitting these molecules up to isolate the hydrogen is very difficult and not so green. Separating hydrogen from water can be done by heating carbon with steam but this uses an immense amount of power. Plus, even though the basic infrastructure would be similar to what we have now, taking hydrogen mainstream would mean that gas stations would need to build new tanks and pumps worldwide. 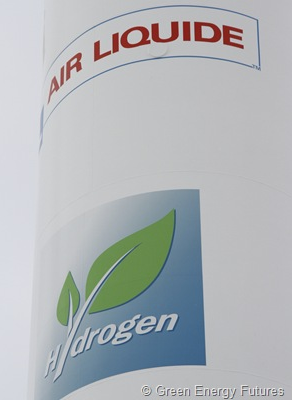 Hydrogen is certainly a realistic prospect though. Because the infrastructure is already in place in California, in 2008, Honda brought the hydrogen powered FCX Clarity to lease customers there. The four-door sedan produces 134hp and has a range of 240 miles per fill-up, giving it greater performance and practicality than EVs like the popular Nissan Leaf. Toyota has also announced that it could be selling fuel cell cars to customers in 2015. You may not know that basically cars already run on air. In an internal combustion engine, most of what is burned in the cylinder is actually air. In fact, even the powerful V12 Ferrari F12, with its 6.2-liter even burns about 14 times more air than fuel. But think about this, if the fossil fuel was taken completely out of the process and the car ran totally on air, we would be able to eliminate the pollution coming from the tailpipe. Obviously air doesn't burn on its own and so in order to power an engine, it must be compressed. Simply put, if we could compress the air and feed it into the cylinder, it would expand and force the piston down without even needing spark plugs. There are some problems though and the first of which is safety. If we start driving around with engines full of compressed air, they could explode in an accident. Additionally, in order to compress the air, we would still need a compressor which normally would run on fuel or electricity both of which could put us back into the polluting category. There are also difficulties with speed and range. Air powered cars could probably have a range of only 100 miles or so and could not reach speeds of higher than 35 miles per hour. Still, the technology isn't far away as Peugeot unveiled a prototype gas-air hybrid concept last year and says they will get their air powered cars on the road in 2016. Additionally, Tata, the Indian company that owns Land Rover as well as Land Rover, is also working on its own compressed air car. Until we see what green rides really find their way onto showroom floors and into our driveways, there are numerous ways to go green with your current ride. No matter what you drive, you can do your best to keep it as green as possible through driving with a lighter footprint through slower acceleration, looking at greener options for insuring your ride like The Green Insurance Company, and following green car trends by light-weighting as much as possible by removing excess baggage (so to speak). "Light-weighting is clearly a way to positively impact fuel economy over a large number of vehicles." said Tinskey. "Ford has made a big stride with our announcement that the next-generation F-150 will weigh up to 700 pounds less than the current model, while not sacrificing any of its durability and capability." 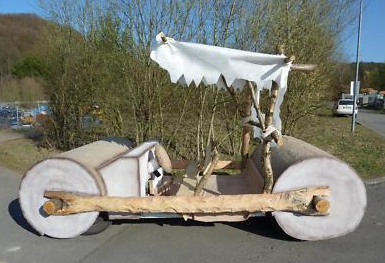 And don't forget, you can always go the Flinstone's route and keep it as green as possible by using your own power to get where you need to go. Something to think about and hey, it's pretty darn inexpensive to power up your own bike and it's a pretty great way to live healthier for yourself and our planet. On account of expanding consciousness of ecological issues, and a craving to eliminate our fuel costs, increasingly individuals are picking to buy green cars instead of customary petrol vehicles. The innovation is growing quick, nonetheless, and it can be anything but difficult to get impeded in the wording used to depict these eco-accommodating machines. Thank you for your post. I like to read future related blog or article. I think the green car's future is very good. Hope you post your next post soon.